I used a variety of patterns for the background of my layout. I added the transparency at the bottom of the layout to cover the wood grain paper. I love how it looks. And to add a little color to the heart pattern, I colored a few hearts with a pink marker to help blend the pattern in with the layout. I used the green and blue strip paper to make a little collage of embellishments on the right-side of the layout. 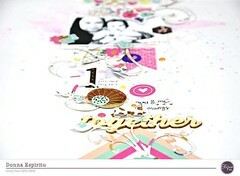 Categories: Art Studio | Tags: Altenew, American Crafts, clique kits, Elle's Studio, Markers, pretty little studio | Permalink. I love that you added some more colorful hearts and all the different papers, adorable!